Welcome to the Taipei ESCAPES site! 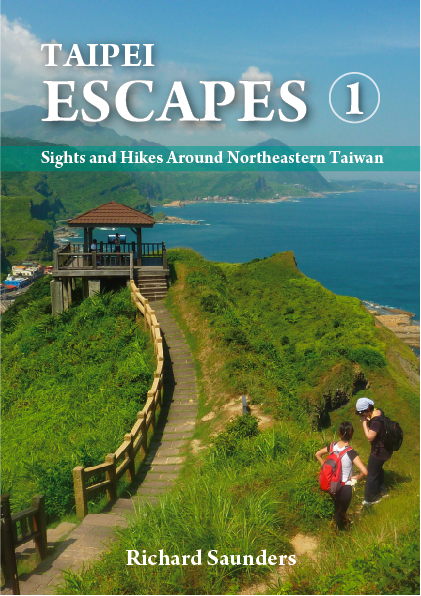 This website supports my two books, Taipei Escapes I and II, and features photos and updates of the forty Walks and twenty Day Trips in those two books. To get started, click on the ‘Taipei Escapes 1’ or ‘Taipei Escapes 2’ tabs above to get to a list of the thirty trips in each book, then click on the desired Walk or Day Trip to zoom to that trip’s own page. Photos are up on virtually all sixty pages (some have many more photos than others), and any updates will be posted on the respective page as soon as I’m aware of them. – Anything else you’d like to share! November 2012: Trails in the Full Moon Forest and mount Beichatian area are closed because a stretch of the road in the Full Moon Forest Park has been wiped out by Typhoon Soala in August. The Jiajiuliao Trail however is apparently passable with care. Walk 20: Trail to Yuemeikang Waterfall impassable (September 2012) According to a second hiker, however it’s passable! Day Trip 4: Boats (temporarily?) no longer running to Keelung Island from Bisha Harbor, only from terminal opposite Keelung Train Station. Walk 40: The regular (and much more convenient) bus from Hsinchu High Speed Railway Station to Lion’s Head Mountain (and also the bus connecting the visitor center and Quanhua Temple at the end and beginning of the walk) has started running once again.